Necessity is the mother of invention. When the real railroads needed some special tooling to solve some kind of problem, they usually invented something to do it themselves. The same thing happens with model railroads. Every so often, something special is needed and the creation of a non-revenue maintenance of way (MOW) car will often solve the problem. I don't intend to cover models of MOW cars that the real railroads used, but instead cover cars that don't have a prototype but are required to do some useful task on a model railroad. It was a fine Sunday afternoon and I had just finished converting my last heavyweight to 4 wheel trucks to reduce the drag and the testing was going well. Then, my Aristo Pacific began to wobble like mad. This could only mean one thing, another damn driver screw had come loose. Worse yet, it had fallen out. I thought that I had locked all of them with LocTite, but I probably did something stupid like only locking the ones that were loose. Somewhere, out there, mixed in with millions of pieces of ballast was an odd sized, odd threaded machine screw. What was even worse, I knew that I didn't have another one. I could always get one from Aristo, but it would take weeks and a single screw would probably cost more than $5 after shipping. I was truly bummed. However, the day was saved. The GIRR MOW crew leapt into action. They grabbed the nearest available revenue car and modified it for temporary MOW service. In one pass over the railroad, the missing screw was found. Its lockwasher was found too, but separately. Another 4 screws were also found which could not be identified by the mechanical department. Even more iron bearing scrap was recovered from the line (wire clippings and such). The car was a total success. After its MOW service was over, it was quickly returned to revenue service. The car was constructed from an Aristo bulkhead flat car. A sheet of 0.060" styrene was cut to fit between the frame rails and attached in place with Zap-CA. A large very strong ceramic magnet which had been recovered from the magnetron of a defunct microwave oven was placed on the sheet and held in place by two smaller magnets placed on the other side. 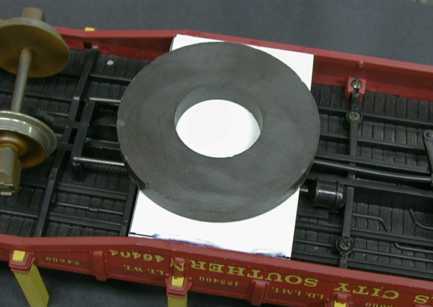 The magnet was mounted near one truck so that the magnet would stay near the track centerline on curves. 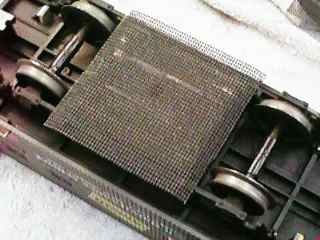 To return the car to revenue service, the magnets were simply removed with the styrene sheet left behind. It is not visible from trackside. The number of this car has been recorded by the MOW crew in case it should be called for MOW service again. During the construction of the GIRR, the vast majority of the curved track was bent by hand and eye. The curves weren't guaranteed to be consistent. This curve tester was hacked together from two Aristo flat cars. One has a styrene strip taped to the bed. The strip extends over the bed of the other car. While the car was in no way calibrated for curvature, it was clear where the tightest curves were so that track could be adjusted. 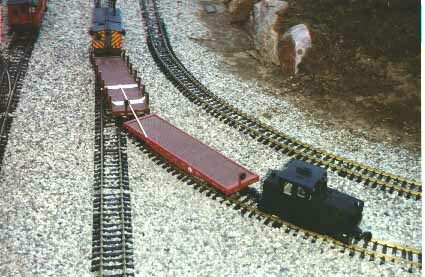 A more common model railroad MOW car is a track cleaner. For those that use track power, track cleaners are real handy and they do work. The ubiquitous Aristo track cleaning car can be improved by simply gluing a piece of drywall screen to the pad. The car works much better and the screen doesn't have to be cleaned like the pad as the crud just wads up and falls off. An Aristo Streamline can be converted into a highly effective track cleaning car. Details of this conversion can be found at my Track Cleaning Tips page. This car converts between revenue and MOW service in about 5 seconds. This page has been accessed times since 09 July 00.